This week’s return is one of the most beloved Montreal Canadiens of all-time, Jean Béliveau. Being a hockey fan in general, I felt my collection would never be complete if I was missing an auto from “Les Gros Bill”. The Hockey News back in 1998 ranked Jean as the 7th greatest player in NHL history. If you look at the list he is ranked above great players like Bobby Hull, Ray Bourque, Guy Lafleur and Mark Messier. I never had the chance to see him play (wasn’t born yet), but if you speak to anyone that had seen him play, he was the COMPLETE package. Such a good player that Frank Selke bought an entire hockey league to ensure that the Montreal Canadiens were going to get him wearing the red, white and blue. No player in NHL history has their name engraved on the Stanley Cup more than Jean. 10 times as a player he won the Stanley Cup and 7 times more as a member of Montreal Canadiens management team. His career began in 1950-51 where he played just 2 games and registered 2 points. His first full NHL season was in 1953-54 which then resulted in his first NHL rookie card being created. This card is from the 1953-54 Parkhurst Set and is worth about 600 bucks in Near Mint condition. I mailed away the only Jean Béliveau card I owned which was from the 06-07 Parkhurst set. In less than two months I received the card back and signed. I think it is really neat to compare the two autographs which were taken about 58 years apart. 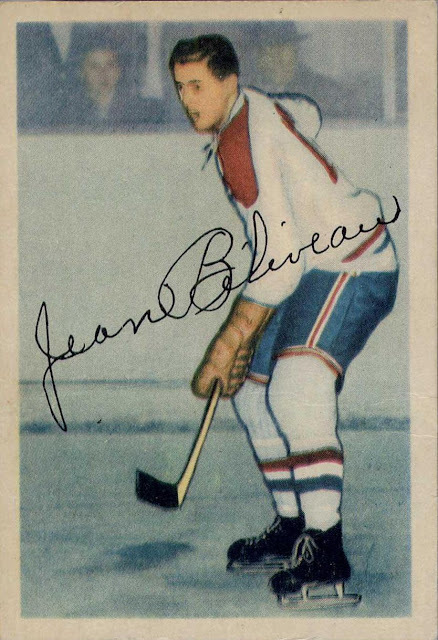 The feeling of an autograph arriving in the mail still excites me and I am glad that players like Jean Béliveau find the time for fans like me! One neat thing about Jean Béliveau is that as great as he was portrayed and remembered by fans, he only ever lead the league in points once. In 20 years, he only ever won the Art Ross trophy one time in 1955-56. Who would believe that the player many believe as the 3rd best centre in NHL history would have only won the Art Ross trophy once? It is important to point out that even though he only ever led the league once, he could still put up points with the best of them. In his 20 years, he was in the top 3 in NHL scoring 7 times and top 10 a total of 12 times including his last season where he also lead the NHL playoffs in assists en route to his 10th Cup as a player. 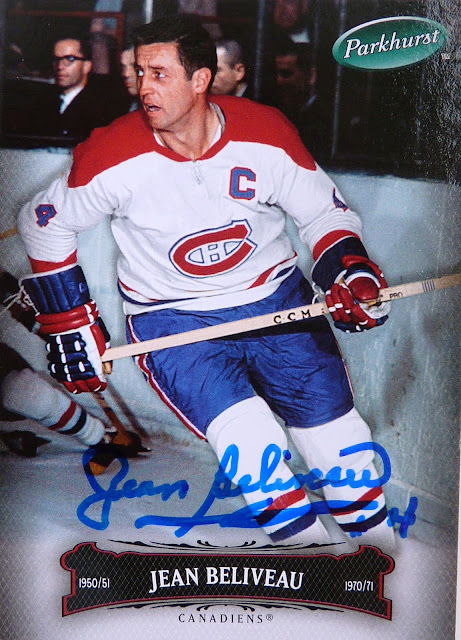 That is why Les Gros Bill is certainly among the best of all-time and why I am very proud to have his autograph! What does Les Gros Bill mean? I know Les Gros means "the large" and bill I think is the same in both languages. It is a reference to a French Folk Hero but I don't know the story or anything cool like that. That is crazy he only won the Art Ross once. All those Habs fans go on about him like he is the best of all time.